NUTRALYS®, a family of functional proteins from the yellow pea, delivers unique nutritional value and excellent functional properties. This protein provides high emulsion / gel properties and stability to many finished products. It is dispersible, free-flowing and easily processed. NUTRALYS® is highly digestible (98%), all natural, non-allergenic and non-GMO. NUTRALYS® is 85% protein and has a rich amino acid profile; particularly the level of lysine, glutamic acid and arginine. Its amino acid profile corresponds with the profile recommended for adults by the FAO (1985). 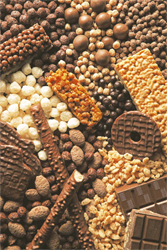 NUTRALYS® can be used in many applications including vegetarian meat products, prepared meals, bakery and snacks. NUTRALYS® is an appropriate source of protein for vegetarians. It also acts as a binder for various ingredients. Extruded, NUTRALYS® becomes a textured vegetable protein imitating the texture of meat.